Oseetah Marsh, with Scarface Mountain in background. Photo by Phil Brown. 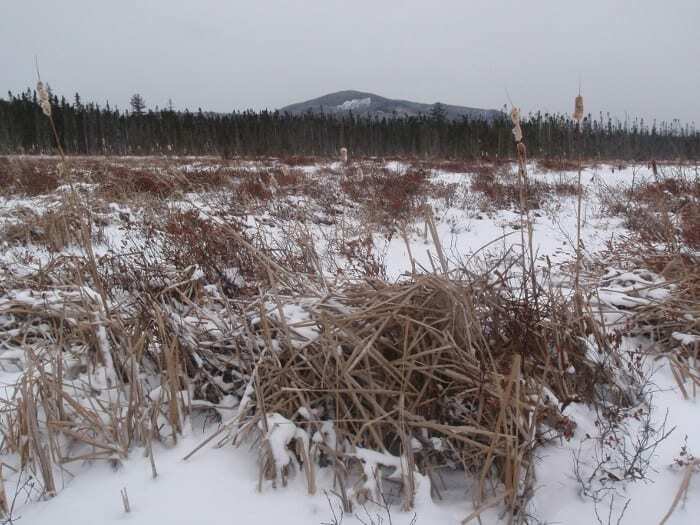 Oseetah Marsh just outside Saranac Lake is the destination of one of my regular lunch-hour ski trips. It’s short, easy, and scenic, with views of the McKenzie Range, the Sawtooth Range, and nearby Scarface Mountain. Today I did the trip for the first time this winter. Why did I wait so long? 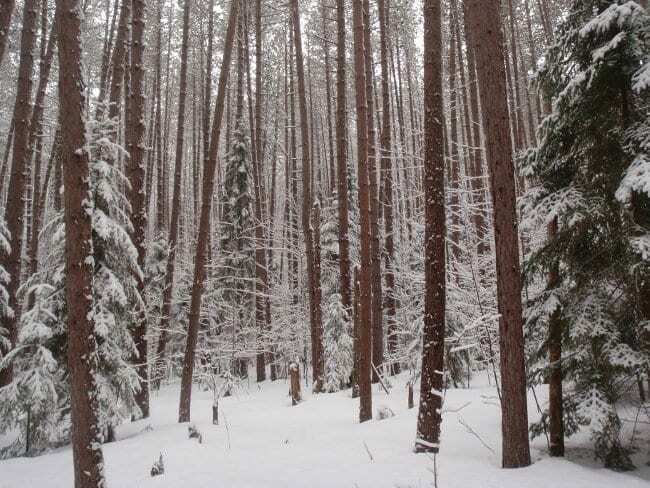 To get to the marsh, I follow a snowmobile trail through a beautiful pine forest. Until this afternoon, every time I reached the edge of the marsh I found a small pool of black water, bordered by very thin ice. I tried to ski the marsh as recently as late last week. Given the cold weather since then, I decided to try again today, and I’m glad I did. The ice was solid, with no slush. I did a short loop, taking in the views, and then returned to the office. Nevertheless, we could use the frigid weather this week (it’s supposed to get to 20 below on Tuesday night) to solidify the ice on lakes, ponds, and stream crossings. The ice has been unusually thin this winter. In fact, the state issued a news release a week and a half ago warning people. On a ski trip on Saturday, I found running water and wet spots in a few places on the Jackrabbit Trail. Let’s hope these get frozen as well. In what has become an annual rite, I skied the 24-mile Jackrabbit from Saranac Lake to Keene to attend Mountainfest. I met Mike Lynch, the outdoors reporter for the Adirondack Daily Enterprise, at Rock and River Lodge. We went to the spaghetti dinner hosted by the Keene Fire Department and then watched a slide show by Freddie Wilkinson, a professional rock and ice climber. I’ll link to Mike’s story about the Mountainfest when it appears online. Since many people ski the Jackrabbit, I thought I’d share my observations of the conditions, section by section. 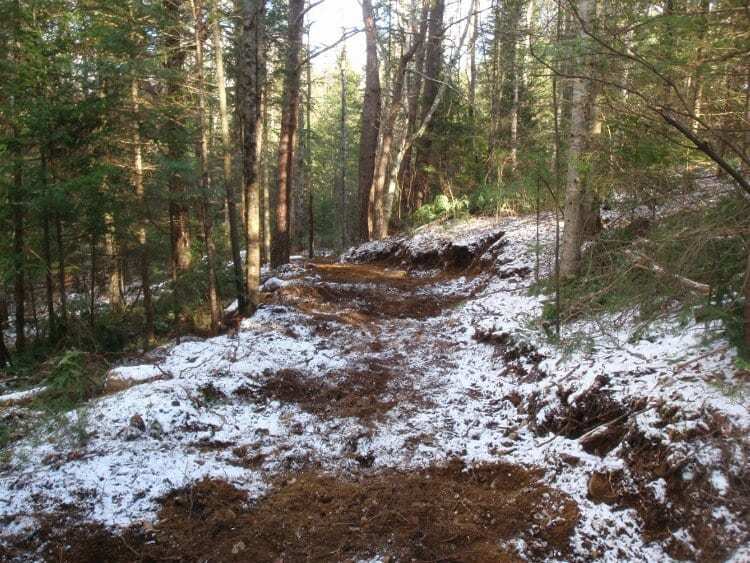 The bottom line is that the snow cover was often thin, but the whole trail was skiable, if marginal in places. North Country Community College to McKenzie Pond Road: The one wet spot, before the wooden bridge, is easily avoided and may be frozen by now. 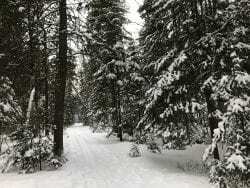 McKenzie Pond Road to Whiteface Club: Extreme caution is advised on the hills on either side of McKenzie Pass (especially on the west side). I encountered small rivulets, exposed rocks, and patches of open ground. The cover improves the higher you go. Winds on Sunday scattered debris on the trail to Oseetah Marsh. Whiteface Club to Lake Placid Club: No problems on the Whiteface Club’s golf course or on the Brewster Peninsula Trails. When I got to Howard Johnson’s in Lake Placid, I deviated from the Jackrabbit. Instead of following the trail through residential neighborhoods on the outskirts of the village, I walked to Mirror Lake, skied across the lake, and picked up the Jackrabbit again at the Lake Placid Club and Resort. I find this more enjoyable and more scenic. Incidentally, a dogsled operator told me the ice was eight inches thick. People were playing hockey and skiing on the lake as well as riding dogsleds. Lake Placid Club to Cascade Cross-Country Ski Center: Due to wind, the coverage on the golf course was variable, but this posed no problems. The trails at Cascade were in fine shape. Cascade to Rock and River in Keene: The long climb up the plowed Old Mountain Road is no fun, especially after a long day. I found enough snow on the side of the road or on the banks so I didn’t have to take off my skis. Ice climbers had post-holed the first half-mile or so of trail to reach the cliffs on Pitchoff Mountain. I was more worried about the long downhill on the other side of the pass. For the most part, it proved to be in decent shape except for one exposed patch that I rode over. A FEW CAVEATS: Often the larger problem on my trek was not a shortage of snow, but the nature of the snow. The trail was rough and frozen, usually with a hard crust on the sides of the ski track. If we get a snowfall on top of this solid base, conditions will improve greatly. 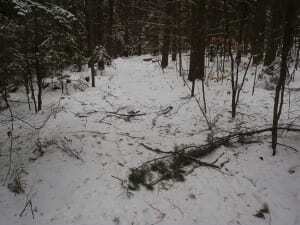 Also, on my ski to Oseetah Marsh, I discovered that Sunday’s high winds left the trail littered with pine needles, twigs, and small branches. Presumably, similar debris will be found on the Jackrabbit and other trails. It’s also possible that trees were blown over.